I’ve noticed that I get very easily “blocked” on a project if there’s something bothering me. I don’t always notice straight away that something is up. A project bag just drifts to the bottom of the pile. I prioritise other things, and it’s often only a few weeks later (sometimes months) that I start to wonder why I stopped work. Longterm blog readers my remember this Briochevron Wrap that I started on the summer holidays in 2017! I blogged at the time about an error I had made, and how I was going to see whether I could live with it or not. Well, the outcome says it all in this instance! I put the project bag away and it took me over 18 months to get it back out again. One quiet morning a few weeks ago, I retrieved the bag full of beautiful yarns and took the needles out of the knitting. 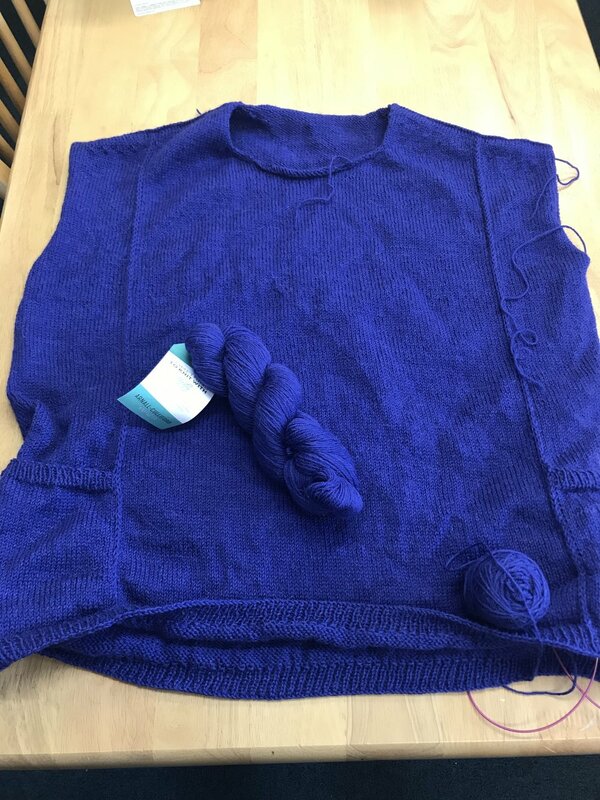 I carefully ripped back row by row to below where the lump in the knitting was, and then picked all the stitches (including their yarn overs) back up again. It wasn’t quite as painful to pick up the stitches as I had been anticipating. Since then I’ve been picking it up at every opportunity, and I am loving the interplay of the different yarns and colours. This is my Sterlyn shawl, another Joji Locatelli project, and this month’s Boost Your Knitting design. I’ve not done very much work on it recently, but I don’t think that’s down to any particular block. I’ve just had other more pressing projects to get to the right stage with (I have so many part-done Boost projects on the go at the moment!!). We have holidays for the next couple of weeks so I’m hoping I might motor through the second lace band, and have a finished project to show off after Easter. Fingers crossed! The only thing that might tempt me away from finishing off Granito or Sterlyn is the allure of this ball of Mind the Gap sock yarn from Trailing Clouds. It was my Christmas present from the family, and I’ve shamelessly copied someone on Instagram (I looked under all the hashtags I could think of but couldn’t find them) and wound it by hand so that the colours stay together and it looks beautiful. I grew up in west London and used the tube all the time as a teenager, so having a pair of London Underground socks is very appealing. Do you get blocked by problems in your knitting projects? Please tell me it’s not just me! For details on each of my knitting projects, do click on the photos to go to my Ravelry project pages. There you will find the yarn, needle and other information about my progress. And for the Briochevron Wrap (by Stephen West) and Granito Sweater (by Joji Locatelli) you will be able to click through to the pattern pages where you can purchase the pdf patterns and knit along! Happy knitting!